What Do You Do During the First Five Minutes of Any Meeting? The opening five minutes offer us a rich opportunity to capture the attention of students and prepare them for learning. They walk into our classes trailing all of the distractions of their complex lives — the many wonders of their smartphones, the arguments with roommates, the question of what to have for lunch. Their bodies may be stuck in a room with us for the required time period, but their minds may be somewhere else entirely. It seems clear, then, that we should start class with a deliberate effort to bring students’ focus to the subject at hand. Unfortunately, based on my many observations of faculty members in action, the first five minutes of a college class often get frittered away with logistical tasks (taking attendance or setting up our technology), gathering our thoughts as we discuss homework or upcoming tests, or writing on the board. Lang has some great suggestions, starting with his first and most important one: Open with a question or two. In so doing, you articulate the purpose of that particular class. Perhaps you intrigue them a bit and/or capture their attention. You also invite their active participation. The same advice holds true for meetings at work. As the leader of a team, consider carefully how you start your meetings. Do you launch into mundane administrative talk, or do you articulate a clear and compelling question? In so doing, are you articulating the purpose of the meeting quite clearly? Perhaps most importantly, by starting with a question, you are inviting your team members' comments, insights, and questions. You are drawing them into the conversation and giving them license to share their ideas. Broadcast Television: How Can They Discount the Netflix Threat? Wurtzel said Symphony's data also revealed that most viewers of those SVOD (subscription video on demand) shows return to their old viewing habits by the third week. "[By then], people are watching TV the way that God intended"—that is, via traditional, linear viewing—said Wurtzel. "The impact goes away." That's because Netflix has "a very different business model—their business model is to make you write a check the next month," said Wurtzel. "I don't believe there's enough stuff on Netflix that is broad enough and consistent enough to affect us in a meaningful way on a consistent basis." The average Netflix subscriber streams movies and programs for two hours a day, according to estimates from Rich Greenfield, an analyst at BTIG Research. That's huge. Not only is that mean average domestic number up around 18 minutes per subscriber per day on BTIG's last estimates, but it is a major benchmark that suggests Netflix is really eating traditional TV's dinner. Does Group Loyalty Breed Unethical Behavior? Angus Hildreth, Francesca Gino, and Max Bazerman have conducted a fascinating set of experimental studies that study the question: Does group loyalty breed unethical behavior? Here's how they examined that research question. They engaged members of three college fraternities. First, they asked them about their loyalty to their organization. A week later, they asked the fraternity brothers to solve a series of puzzles. They could earn money if they solved them correctly. Moreover, they could earn an additional cash prize if their organization outperformed the other two fraternities in the study. The participants could score themselves in this exercise, providing them an opportunity to cheat. The researchers employed a mechanism to determine who had cheated. What did they find? Interestingly, the fraternity members who expressed stronger loyalty to their organization tended to cheat less in this exercise. Loyalty did not breed unethical behavior. What did they find? The members who received the first note again tended to show the same pattern: loyalty tended to be correlated with ethical behavior. However, for those receiving the second note, they saw a different pattern: "Strongly loyal brothers cheated at a rate of 66 percent, compared to only 42 percent for those who were less loyal." In this case, loyalty seemed to breed unethical behavior. In this video, Stanford's Jennifer Aaker explains why articulating clearly the purpose of an organization or team gives meaning to what people do and enhances their satisfaction as well. With this research in mind, think about offering a gift certificate to dinner or tickets to a ballgame to one of your hard-working employees for a job well done. Perhaps that small token of appreciation may be a more effective way of expressing your gratitude than offering them a material gift. We talk a lot about reinventing ourselves. I’m constantly in front of the company explaining to them, “The skills that I had to take this company from zero to $20 million are very different than the skills that are going to take this company from $100 million to $200 million. Every six months, I’ve had to reinvent myself, and so what are you doing to reinvent yourself? And we’ll give you the tools you need to help you do that.” We have to just keep reinventing as time goes on, and part of that reinventing is constantly challenging each other about what could we do better, and what could we do differently. Cabrera offers an important lesson for leaders here. He reminds us that people and organizations need to reinvent themselves from time to time. They have to learn and develop new skills and capabilities. The CEO sets the tone. By talking about his own need for personal reinvention, Cabrera offers an example for all the people in his organization. He can't stand pat, so they should not do so either. He's pledging to develop new capabilities and asking them to do so as well. In too many organizations, CEOs ask their employees to engage in training and development activities, but they don't seem to think that they need them. The best leaders acknowledge to all that they are still learning and developing as well. Should You Pursue a Side Gig? Having a side gig to work on outside of your regular job isn't just about earning extra cash. Most importantly, a side project offers the opportunity to do meaningful work that can promote career growth and satisfaction. "Choosing a side gig is deeply personal; the right one fits like a favorite pair of jeans, stretchy in all the right places," writes Kimberly Palmer in her book The Economy of You. "Side-giggers find ways to exploit their unique skills and interests along with what’s currently marketable." How do you select the write side gig? Palmer argues that you should consider several questions. Do you have the skills required to be successful in this side gig? Second, are there low barriers to entry, meaning can you get started with limited expense? Third, can you make the gig work in terms of work and family schedule? Most importantly, though, you have to ask yourself: Will this extra work be meaningful for me? Is it about more than the money? What New Year's Resolutions Have You Broken Already? It's that time of year. Many people make New Year's Resolutions. Unfortunately, the majority of Americans break those resolutions, some sooner than others. Here's Jimmy Kimmel's funny take on this situation. 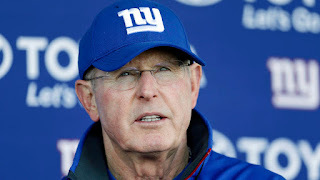 Yesterday, Tom Coughlin stepped down as head coach of the New York Giants. Coughlin has enjoyed tremendous success as a football coach. He won two Super Bowls as head coach of the Giants, as well as another one as an assistant back in 1990. He built the Jacksonville franchise from the ground up, when it was an expansion team. In addition, he turned around the Boston College team as head coach of that college program many years ago. It pains me that he defeated my beloved Patriots twice in the Super Bowl, but I have a great deal of respect for his work as a coach. Everything changed, of course, after Coughlin was nearly fired following the 2006 season. John Mara (owner of the Giants) told him he needed to take something off his fastball, that he had to ease up with the players and the news media, and Coughlin agreed. The coach told Mara he wanted to establish a leadership council of veterans to bridge the divide between his office and the locker room. "If I could do cartwheels," Mara said, "I would've done one that day." There were assists along the way. Coughlin's wife, Judy, and children implored him to show his private self in public settings. Charles Way, a former Giants fullback serving as director of player development, told Coughlin that many players didn't have father figures and that they needed to see him in that context. "Right now, they feel it's us against them," Way told him, "that you don't care about me, that I'm just a piece of meat to you, just a number to you. And if you want them to play for you, given the way you are, you have to show them that you care about them, which I know you do. But you have to show them that." What's the lesson here? Leaders, professors, and teachers should set high expectations and demand a great deal from those with whom they work. Discipline, hard work, and a high bar should be part of their approach. However, they only will get the maximum effort from others if they also show that they care. If others believe you care about them, they will run through walls for you. In talking about teaching, my colleague Jane McKay-Nesbitt puts it best, when she says, "If you want them to care about what you know, first let them know that you care." The peer acts like a sparring partner, providing a protected environment in which the person can dare to share a wild or half-baked hypothesis without being dismissed... The first daring experiments in impressionism, for example, were conducted in pairs—by Claude Monet and Frédéric Bazille and by Pierre-Auguste Renoir and Alfred Sisley, and later by Monet and Renoir. Farrell also mentions the authors J.R.R. Tolkien (The Hobbit, The Lord of the Rings) and C.S. Lewis (The Chronicles of Narnia), who discovered that they shared an interest in what Lewis called “Northern-ness.” Recent history is full of pairs who created legendary companies: Steve Jobs and Steve Wozniak, Sergey Brin and Larry Page, Bill Gates and Paul Allen, to name a few. I’ve found that pairs can also play a key role in the innovation process at established organizations. What does it take to find a good sparring partner? Trust and respect between the two individuals is a must. A prior working relationship often helps, because that provides a foundation of interpersonal trust and understanding. Some degree of difference in background and perspective can be helpful, in that it generates cognitive diversity. A thick skin is crucial. You don't want someone who has a hard time taking criticism. You want someone who isn't going to play it safe, afraid to hurt your feelings. Finally, you are looking for someone who has similar motivations and objectives. Are you on the same page in terms of what you are trying to accomplish?